At the end of your ballot, after you’ve voted on all state initiatives, rests Measure G.
The proposed cannabis business tax measure is the only local initiative on the Nov. 6 ballot that affects all of unincorporated Nevada County. If passed, it would impose a tax on medicinal, commercial grows in the county. The initiative would enable the county to tax not only cultivation, but also transportation, distribution, manufacturing, processing, storage, packaging, delivering, testing, dispensing and sales. 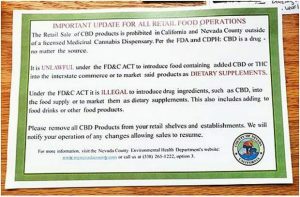 However, at this time the Board of Supervisors is allowing cultivation only, meaning the tax — at least initially — would affect grows only. The tax would affect no personal or non-remunerative grows. A majority of voters must approve the tax for it to become effective. Vernon estimates the measure would raise between $1.5 million and $3 million annually. About $111,300 in annual costs is expected because of the measure. “This is a tax only on the cannabis industry,” Vernon said. The measure would impose a 2.5 percent tax on gross receipts each year. Minimum amounts would be based on a cultivation site’s size. A grow under 2,500 square feet would pay no less than $1,250 each growing cycle — the life of a plant until harvest. A grow between 2,500 and 5,000 square feet would pay a minimum of $2,500 per growing cycle. Grows over 5,000 square feet would pay a minimum of $5,000 each cycle. A cultivator would pay the 2.5-percent rate, if it’s greater than the minimums. Vernon estimated some 3,500 growers operate in Nevada County. Officials think about 175 to 350 will become compliant. Supervisors are locked into the taxation method and rate until July 1, 2021. At that time they can incrementally increase the rates and switch to square footage or gross weight as its method of taxing the businesses. 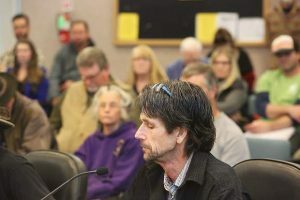 The measure is supported by Supervisors Ed Scofield and Hank Weston, as well as Diana Gamzon, executive director of the Nevada County Cannabis Alliance. No formal opposition exists against the measure. Supporters argue the tax revenue will pay for regulation, education, enforcement and other county services.